With over 70 built projects to date, Ben van Berkel and his talented team at UN Studio are not afraid to leave their mark on this world! Whether it's a sculptural super structure, or a curvacious pavilion, each new project is captivating, purposeful, and mind spelling. UN's latest build, the Haus Am Weinberg, has been in the works for the past four years, which is short in architecture years, but quite long for the fans who anticipate UN's new work. 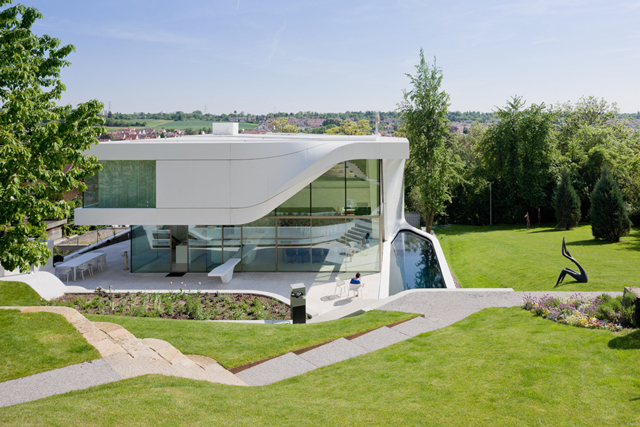 The new home hails all the way from Stuttgart, Germany with pastoral views of the stepped terraces of an ancient hillside vineyard on one side and cityscape vistas on the other. The team at UN explained the intentions of the curves, and that each undulation "reacts and responds directly to the sloping landscape of the site, where the scales and inclinations of the slopes which sculpture the vineyard setting are reflected in the volumetric appearance of the house." 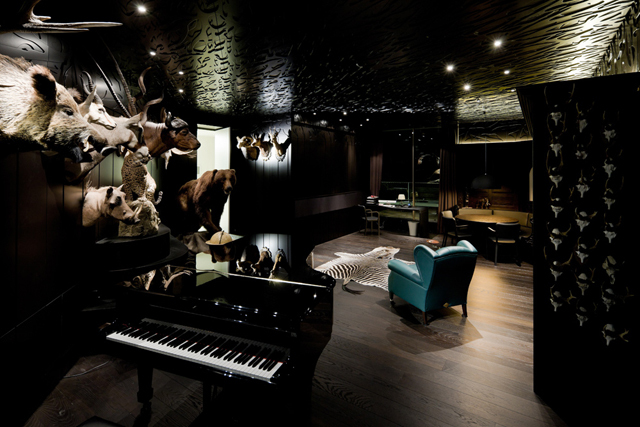 The interiors enhance the form of the home by a single gesture, ‘the twist’. 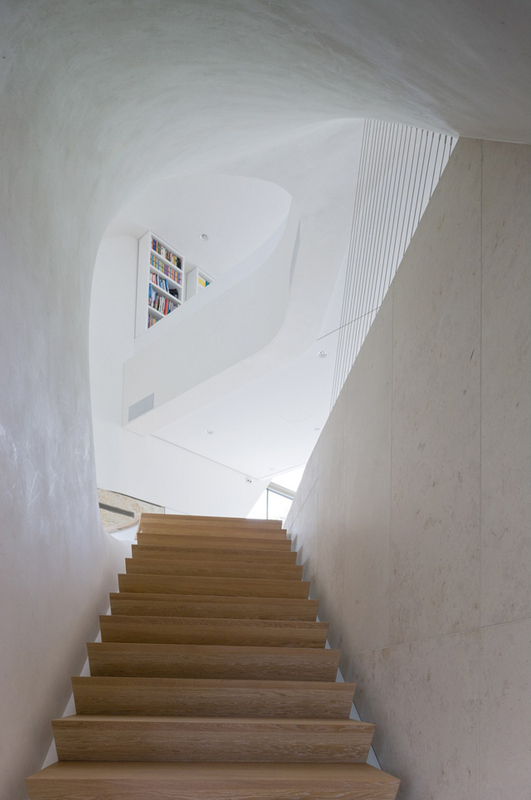 "This central element supports the main staircase as it guides and organizes the main flows through the house. The direction of each curve is determined by a set of diagonal movements." 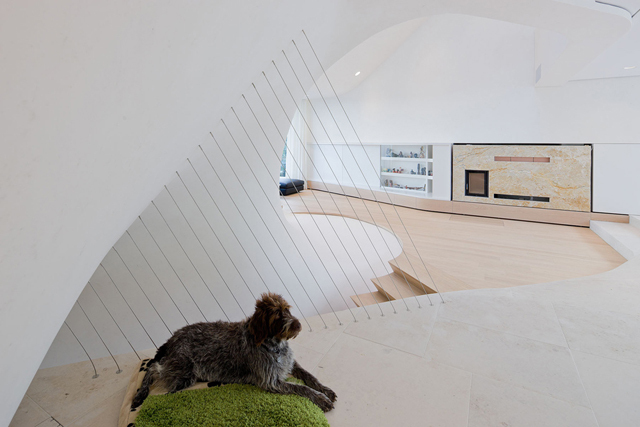 As the program distribution follows the path of the sun, each evolution in the twist leads to moments in which views to the outside become an integral experience of the interior. Notes From The Architect: A double-height, glazed corner - which houses the dining area - opens up to extensive views towards the North-West and frames the vineyard hill which forms the backdrop to the house. Views from the living room are extended by means of a fully glazed corner affording open vistas toward the nearby park lands to the South-West. Further views from the twist are encountered on the second level, where the master sleeping and wellness areas are located. Notes From The Architect: The interior of the Haus am Weinberg is arranged into spaces of varying atmospheres and spatial qualities, with the four glazed and open corners allowing daylight to reach deep into the house. The materialization of the interior of the house further accentuates the overall atmosphere of light by means of natural oak flooring, natural stone and white clay stucco walls speckled with small fragments of reflective stone.